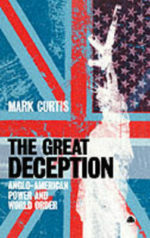 In his ground-breaking new book, Mark Curtis reveals the secret history of British collusion with radical Islamic and terrorist groups. It shows how Labour and Conservative governments have connived with militant groups linked to al-Qaida to control oil resources, overthrow governments and promote Britain’s financial interests. 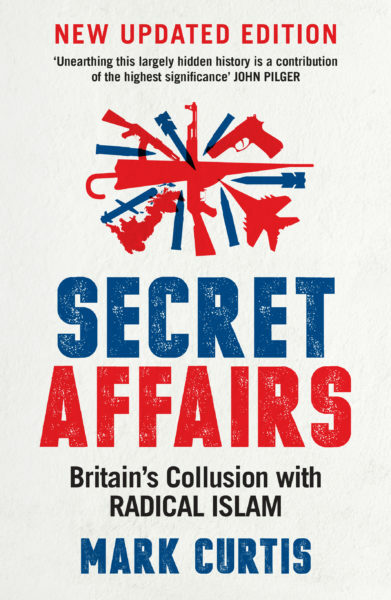 Secret Affairs reveals how Britain has covertly supported radical Islamic groups in Afghanistan, Iran, Iraq, Libya, the Balkans, Syria, Indonesia and Egypt. Drawing on declassified government files, it documents Britain’s hidden strategic alliance with the two major state sponsors of radical Islam – Saudi Arabia and Pakistan. And it shows how British policies of ‘divide of rule’ – rooted in the Empire – have used Islamic forces to promote imperial interests in India, Palestine, Jordan and Yemen. Similar British policies continue today in the wars in Afghanistan and Iraq. 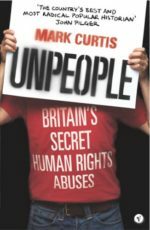 Curtis shows that Britain is complicit in the deaths of ten million people since 1945. These are Unpeople – those whose lives are seen as expendable in the pursuit of Britain’s economic and political goals. The book pieces together the Blair government’s “public deception campaign” on Iraq and reveals government plans to increase “information operations” directed towards the public and to embark on a new phase of global military intervention. He also reveals from the declassified British government documents the hidden history of unethical British policies, including support for the massacres in Iraq in 1963, the backing given to the rise of Uganda dictator Idi Amin and the extraordinary private support of the US in its aggression against Vietnam. 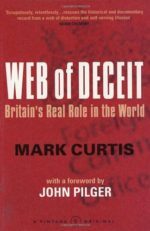 In this best-selling book, Mark Curtis reveals a new picture of Britain’s role in the world since 1945 and in the “war against terrorism” by offering a comprehensive critique of the Blair government’s foreign policy. Curtis argues that Britain is an “outlaw state”, often a violator of international law and ally of many repressive regimes. He reasons not only that Britain’s foreign policies are generally unethical but that they are also making the world more dangerous and unequal. The book also draws on formerly secret government documents showing the British policy of depopulating the Chagos Islands, the brutal wars in Kenya and Malaya and support for the massacres in Indonesia in 1965, among others. Across the world, poor people are suffering as a result of the current global trade system. The trade rules negotiated in the World Trade Organisation (WTO) cover not merely trade issues, but also investment, services, agriculture and intellectual property rights, and have been made primarily in the interests of business corporations in developed countries. 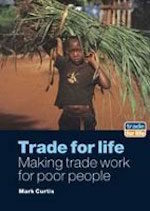 This book, written for Christian Aid’s trade campaign, analyses the nature and impact of the global trade agreements and recommends how they need to change. Debunking some of the myths of post-cold war power, Mark Curtis shows how Britain remains the key supporting player in US hegemony and how far from benign this special relationship is in its impact on the rest of the world. The book analyses the nature of the special relationship in the Middle East and at the UN, the recent phenomenon of so-called “humanitarian intervention” and the reality behind the two states’ “development” agendas. Using formerly secret government documents and independent sources, this historical study argues for a radically revised understanding of post-war British foreign policy. 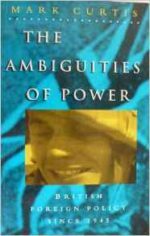 Curtis shows that, contrary to the impression usually conveyed by both academic writing and press coverage, British policy, in both intention and effect, had been far removed from the principles it has conventionally been assumed to be based upon: the pursuit of peace, the promotion of democracy and human rights, and the relief of poverty. The book covers the whole of the post-war period. It examines British foreigh policy planners’ aims and interventions in a host of developing countries, as well as looking at the special relationship with the United States.